My outfit today consists of an old hoodie, yoga pants and a baseball cap... BUT I managed to look cute a few times over the past week or so and so I thought I'd share! Last Friday was the crisp and cool and the PERFECT day to wear this new sweater from Hippie Chick Boutique. It's currently not in stock, but she's ordering more - so be sure to follow her on Facebook and Instagram so you get the heads up when she's going to restock the website! I paired the sweater with an older top from Altard State (this tunic is a FANTASTIC color that is really similar... would be great with a military jacket, mustard cardi, brown blazer, etc. Love this color! 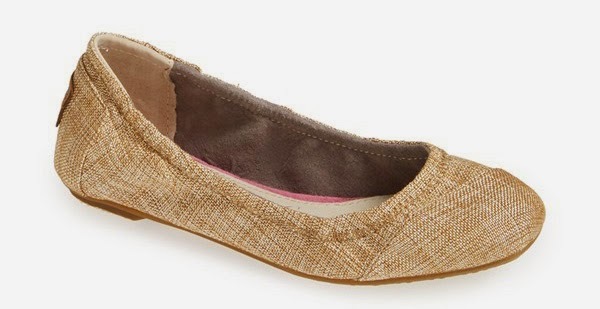 ), TOMS ballet flats and distressed jeans (here's a similar pair that's on sale!). You can't see it in the pic, but I also had on a navy infinity scarf. I got TONS of compliments on this outfit - so comfy and "Fall" and super cute! EASY!!! My ballet flats are leopard (which I can't find anywhere anymore), but this neutral pair, is ON SALE at Nordstrom for 33% off making them $57 !!! They're the perfect neutral for Fall! I posted this picture on Monday and promised outfit details, so here we go! It was FREEZING at Luke's soccer game and my hair was gross, so I threw on a Judith March baseball cap (mine is sold out, sorry!) with a plaid shirt (mine is from Anthro in the summer... but THIS one is really cute), a puffer vest from Old Navy and a big 'ol chunky scarf. I picked up my boots a while ago at Nordstrom Rack, but they're by Sorel and they're AMAZINGLY comfy! This pair from Zappos is similar. PS - if you've been eyeing these studs (or in another color! ), they're 15% off! Snag a few pairs for Christmas gifts! Sunday morning we headed to church (with clean hair! AMEN!) and I paired some of my favorite Fall colors together ;) A fringe scarf, Matilda Jane cardigan and mustard cords. I LOVE me some Nordstrom Rack and HauteLook. I found THIS super cute plaid tank online at Rack and thought it would be perfect layered under a jacket for Fall. Keep in mind when you order from Rack that you can "combine your cart" with items from HauteLook as well. One shipping cost! (if under $100). It was POURING all day yesterday, and so I paired it with a black moto jacket, chunky knit scarf, jeans and black Hunter wellies. And since we're on the topic of hair.... I posted a couple of short hair pics recently and got LOTS of feedback about whether I would ever go short again, etc. and this right here is the answer why I don't have plans to go short anytime soon. I washed and fixed my hair on Sunday morning and I took these pics Tuesday. I throw it up in a bun with clips at night, let it down in the morning and I'm good to go! I can usually go about 3-4 days between washes this way. When my hair was short I felt like I had to wash, dry and style it every single day. Griffin is looking more and more like a big girl every day - and as much as it breaks my heart - I love seeing her little personality grow ;) She is FULL of sass and sparkle! Her cardi and tank are both Matilda Jane Spring 2014, her jeggings are GAP and her bow is by Ruby Blue. The baby Hunters are ridiculous and over the top, BUT she's worn them at least a dozen times already and she looooooooves them! hahaha I think she'll be wearing them a lot this winter and into the Spring. I hope y'all are having a fantastic Wednesday - staying warm and dry!!! Okay. So I bought Carter Hunter's too. Extravagant? YES. Frivolous? YES. Awesome? HECK YES. His foot grows so slowly and I know he'll wear them hundreds of times over the next two years. And you looked way too cute at Luke's soccer game! EEEK! I need to see a pic of Cater in his boots ASAP!!! My favorite look was that moot jacket with the plaid!! Fabulous!!! You look so cute in every single picture! I'm not quite sure which pic is my fave :). just ordered some ruby blues! and alllllllmost ordered the baby hunters (which means, i'll end up ordering....just have to delay to make some mental justification. ha!). YAY!!! Which wraps did you get? I love them all! You are absolutely adorable!!!! I love your style!!!! Agreed! She steals the show and I wouldn't have it any other way! I want your entire outfit from Luke's soccer game! SO super cute, love everything about it! Honestly I just want your whole closet and throw Griffin's in too for Grace!! I was lucky enough to find the cool TX hat! YAY!!! Where did you find it??? Tin Rose Boutique in Cleburne. Would you mind me asking what size your MJ cardigan is? I am trying to decide between the small or the medium. Not sure how it runs. Thanks so much! I love the pink plaid with the puffy vest and the red plaid tank!! Thanks, girl! Loved your outfit post today, too! Just for anyone wondering about the kids Hunters -- I got my kids each a pair last year and I'm telling you, the cost per wear is probably less than a penny!! They can put them on themselves, aren't heavy or clunky, keep their feet dry in slushy/snowy parking lots ... they are hands down the best purchase for them I have made! They are expensive for kids shoes, but I will continue to buy them new ones as they grow out (and the pairs from last year fit them this year too) because they are that worth it!!! I don't think anyone would regret getting them for your kid. Agree 100%! She's already worn them WAY more than I thought she would and it's not even winter! Love how easy they are to slip on and off and how they go season to season. Great buy! Loving those mustard cords!! ...and plaid ANYTHING. You're so stylish!! Andrea, I just bought that ON puffer vest yesterday! The cream scarf is tempting, too! :) I'm not sure when you bought your vest, but I found out yesterday that Old Navy has a 14-day price adjustment period. So if the vest is discounted for cheaper than you paid, you just have to take your receipt to the store for them to honor the lower price. I got an email today that they have a sale. I'm not sure how much the vest is in-store, but I'm planning to go back and check. The vests are 30% off in-store! I have been reading countless reviews trying to see about the sizing of the Ruby Blue wraps.. What size do you have Griffin in? I did read one comment saying they could easily size up or down.. I ordered 12 month- 12 years for my little girl in two of the Christmas prints and if i ordered too big I want to re-order so I get the ones I want before they sell out..